Lot's of Feedback for 2019 Events! So, did you miss all the news in last week's Newsletter? Not a problem, just jump over to our BLOG and find out what you missed! One of the Topics was our pland to upload some videos using Doctor Ben's Products. One Customer/Reader suggested: "You could come up with a variety of different videos, for structures, junk yards, plastic, wood, I could give you a library of various short (5 to 10 minutes each) subjects that would feature ONLY “Doctor Ben’s Scale Consortium” of pigments, solutions and stains and how to apply." Excellent Feedback, huh? Watch for our progress in the very near future! On a sour note, one of our primary wood suppliers announced a price increase in the form of a 50% reduction of an Industry Standard Manufacturer Discount. Fortunately for Scale Model Masterpieces & Doctor Ben's we can still source most of the wood products we use from other manufacturers. But this supplier is a major supplier for most of the LASER Cut Structure Kit manufactures which will probably for them to raise the price of their kits. All that said, you may have noticed the image at right; know what it is? We'll give you a hint: This 1984 kit has only been available in O Scale for the past ten years since 2015. And guess what? We've just about have it ready in HO Scale and as soon as I have the Pilot Model finished this kit will once again be available. Until then, you may find it by selecting the image at right and adding it to your "Wish List". Do than and you get Free Shipping when it's available! See you in the Hobby Room! Scale Model Masterpieces DETAIL PARTS are composed of UNFINISHED/UNASSEMBLED Cast Labstone & plastic tubing parts and Assembly & Finish are Required. More Info Here! 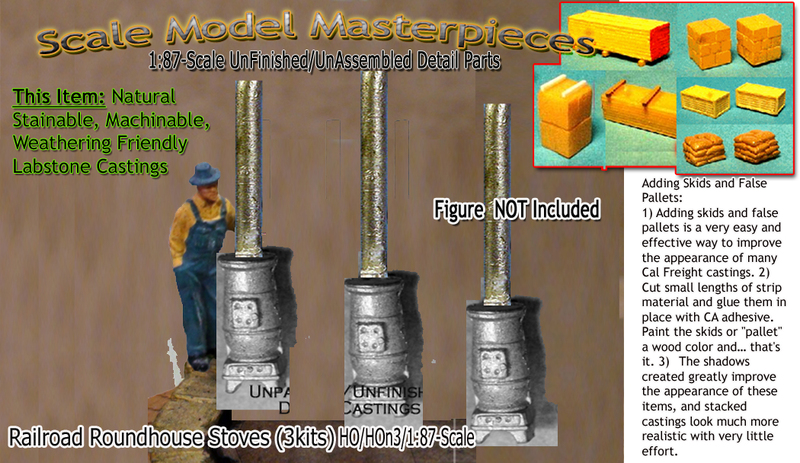 Scale Model masterpieces crates are composed of UNFINISHED/ UNASSEMBLED Labstone (sometimes resin)parts-Assembly & Finish Required. 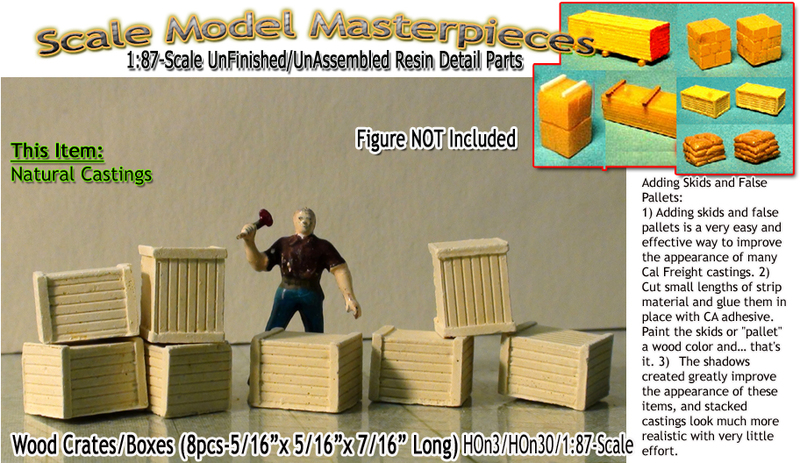 And yes, Doctor Ben's Weathering Stains (Realistic Oak recommended #1081) makes these crates look too real! More Info Here! 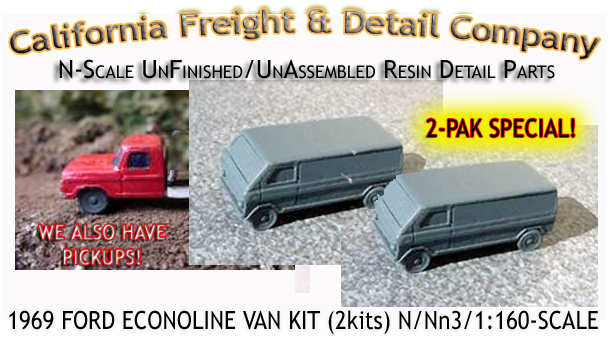 Detail Parts are composed of UNFINISHED/ UNASSEMBLED Natural Resin or Color-Cast Resin parts-Assembly & Finish Required. More Info Here! Original Contest Proven Doctor Ben's Product! 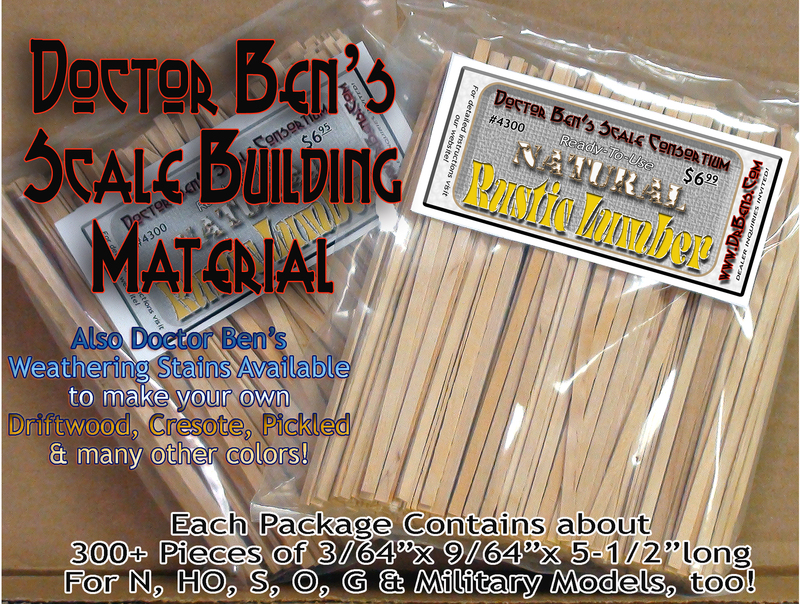 Doctor Ben's Rustic Lumber Instructions: We recommend that you DO NOT pay extra for the other three Rustic Lumber Products. 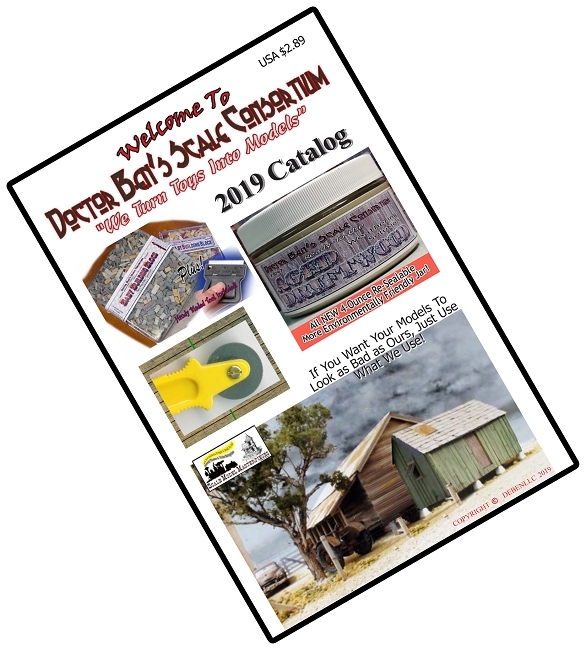 Save yourself some money by purchasing the Doctor Ben's Weathering Stain of your choice (Oak, Pine, Driftwood, Durty Black, Antique White, Barn Red and 12 other Stains) and thinning them down you can create your own original Rustic Lumber! 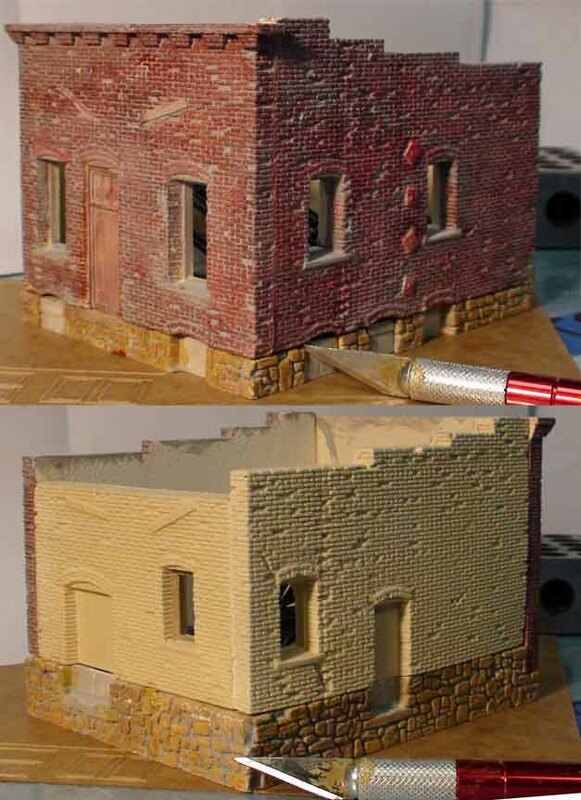 Each Package Contains 300+ Pieces of 3/64''x 9/64''x 5-1/2'' for N, HO, S, O, G & Military Models, too! More Info Here! We've not had time to post any website Blog "TIPS & TECHNIQUES" in quite a while. The following T&T popped up on facebook a couple of weeks ago and one of our DEBenLLC fb friends asked for a more legible (standard fonts) description. 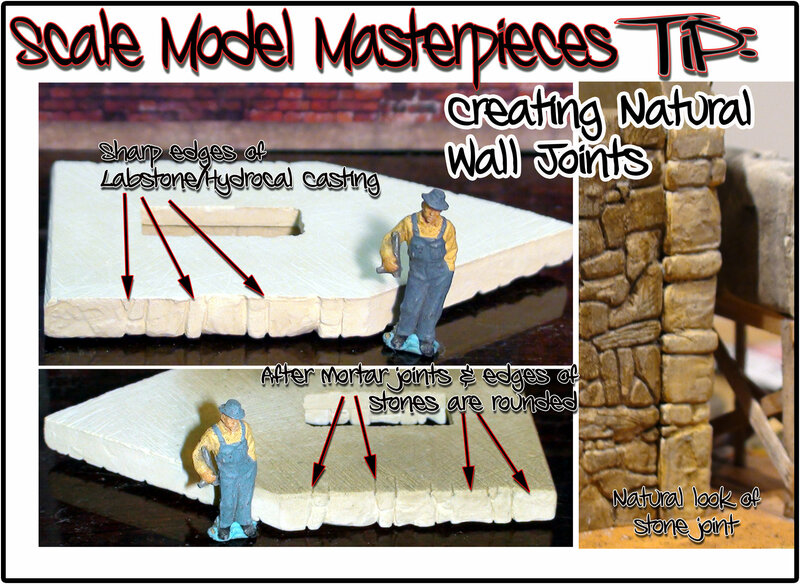 "The corner column protrusion can easily be overlooked when assembling two stone (or brick) walls. The natural inclination is to attempt to ..." CLICK HERE to go to the post. Also, something we found in/on the "new" website is the "Reviews this Item" feature in every product description. Want to be compensated for your review? See the above announcement and please let us know if you have any questions. Be sure to share this newsletter with your friends. Word-of-mouth is our only source of advertising. Many thanks for your continued business.